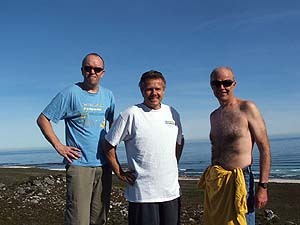 Vince Stevens, Gary Deacon and I enjoyed a DXpedition in the Cape Point reserve, in the southern Cape Peninsula over 11-15 July 2008. We hired a cottage called Eland (more on this word later) which allowed clear space to roll out BoGs beamed WNW and magnetic north. This enabled us to target LatAm and NA as well as south Australia and SE Asia over the shoulder. 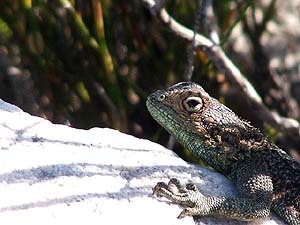 We arrived after protracted rains had caused severe flooding in the Western Cape in the prior week but we saw nothing but sunshine and still, warm days, exceptional for mid-winter and Cape Point, which normally blows a treat. To our west the sea was about 3.5 km away and 5.5km to the east. Vince, Sonia and I arrived at the same time on the 11th with Gary (plus Sandy and young Nicole) due the following afternoon. Nearly two hours before sunset we had BoGs set up and astoundingly heard Perth 720 and soon after Adelaide 729. The noise floor was low, a feature that characterised the whole four days. Looking back though we were a tad unlucky with the K-indices which were running quite a bit higher than in the days on either side. The expedition was to be marked by a steady shift each afternoon further north. If we were to hear New Zealand, that first evening was the best shot. 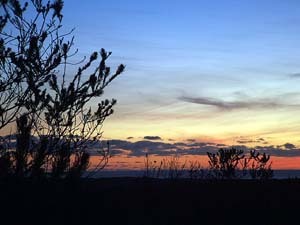 But it wasn't to be and following evenings saw conditions shift away from any chance of making the leap. Vince commented that the distance to NZ is nowhere near as far as it is to, say, northern Queensland, where we had both heard 4TI (2 kW) a couple of weeks before, from Fish Hoek. And Vince heard 4QN 630 in Cape Point too. But the aurora makes Kiwis much more of a challenge, as with Hawaii from northern Scotland. One exciting moment in the early evening was my antenna being jerked out of the back of my receiver. Cape Point is a wildlife reserve and we speculated about what sort of insensitive and un-technically minded buck might have done this. Moving ahead two days we had our answer. Just after lunch Gary yelled out "Eland" as one of the antennae was dragged off. Young Nicole became very alarmed at this as Eland are large buck which do populate the park. There is still some discussion going on about Gary's game-spotting skills as the buck turned out to be three ostriches on patrol. Having had my antenna terminated at about half its 300m length on the first evening I strolled out casually but firmly and steered the trio away from the precious wires. They did not return nor did any other Eland. For me, being able to log Philippines over the first three evenings was a thrill. Vince and Gary have nailed several of these but I'd only heard one, just a few weeks before. In all 5 came up. We also heard some Japanese stations, one for sure, JOIF 1413. The first morning session saw the x-band pretty active but no opening to the US below 1600. We did hear KRND 1630 WY for the first time which was putting in a strong signal with good IDs. It was only on the third morning that the US opened up and even then only a bit. Vince got two on 1460, WZNZ and WTKT. Gary and I heard KGED 1680, neither realizing at first this was not Florida. Only on reviewing the recordings and checking the "The All New Legends" ID, did we twig we'd heard Fresno, California with 1 kW. At over 10,000 miles this was a great catch. Thanks to Patrick Martin in Oregon we already have received snail mail QSLs. On the whole the US conditions conformed with our experience of a mid-winter anomaly for NA. We would expect to do better closer to the equinoxes and even in mid-summer, or further up the sunspot cycle. 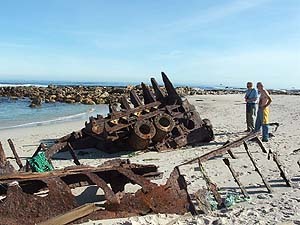 On the Sunday we all took a walk down at the coast to see the Olifantsbosch cottage to scout for a future expedition. The cottage is large and right on the sea. It runs on solar power and we spent much time speculating what a great location it could be. It was a stunning day and we had a fun scramble along the beach and into the bush, taking time to look at two wrecks (Thomas T. Tucker and the Nolloth). I even had a brief dip - mid-winter in Cape Town, thank you very much. One morning a lady game ranger popped in to explain to us why there was a large fire nearby, all under control. As she walked in the door of the covered veranda she saw all our equipment and went 'oooh.' We weren't quite sure whether this noise indicated shock or admiration but she said nothing else so it will always remain a mystery. Possible it was because she hadn't seen a Frog like Gary's for a long time. A highlight for me was Brazil. Although perfectly situated for greyline activity both day and night and not that far away, the way the big ones come blasting in is truly amazing. In the early evening it is like driving around Rio and hitting the auto-tune button. Then there are the low-powered txs, jostling with each other, every now and then one popping up with an id. Radio Jacuipe 1500 is listed with just 250w and Radio Bom Jesus 1570 with 1 kW daytime. We could hear Brazil for nearly 13 hours a day, from before 9 local at night to after 9 in the morning. I also got a real kick out of R Corporación 1380, first time I've heard Chile on AM, although again, both Gary and Vince have been there, done that.